“Old and New Agriculture Buildings,” Histories of the National Mall, accessed April 22, 2019, http://mallhistory.org/items/show/466. The Department of Agriculture's first building on the Mall was completed in 1868, but by the 1890s, the Department was outgrowing its building. In 1901, as part of the McMillan Plan to redesign the National Mall, Congress approved a new office building for the Department, to be built directly behind the first, with the intention that the newer building would replace the original. 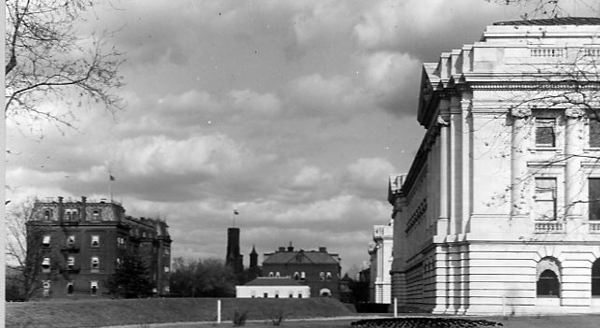 This photo from the late 1920s shows the old (on the left) and the new (on the right) buildings, with the Smithsonian Castle visible between the two. The old building was demolished in 1930. DC Public Library. View original.